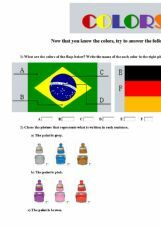 This exercise is about colors. Students who have already studied about this topic might try to answer this exercise in order to practice what they have learnt or just to review it. There are 5 activities in it. Hope you have fun while you answer this exercise. P.S. : One of the listening answers is given because the voice player tool stopped working when I was making this exercise. I have waited for almost 3 weeks and it still doens´t work. I have asked for help, but I didn´t succeed. Anyway, the solution I´ve found was to give the answer as a tip. Hope you don´t mind.